Have you ever created some great content in Facebook posts and the comments underneath, but then lost track of it and failed to re-use it, re-purpose it for content marketing and traffic generation purposes? What a waste, right? Well, my girlfriend Cheryl has been creating a ton of content recently as she started to channel to help other people by answering their questions. One of her posts in a group now has hundreds of comments, and when I copied all the content and backed it up as a text file for her, it had over 25,000 words in it! In this post I will show you how to quickly and easily save content from your posts on Facebook. Get info about the Expand All Facebook Comments bookmarklet here. Creator: Jens Farley. To install or update the bookmarklet, click here to bring up a page with the bookmarklet in it, along with some simple instructions. Navigate to the post you want to expand, and then click the Expand All button on your bookmarks bar. All comments will be opened and expanded. Unicode will keep more information like emoticons and accents and foreign language characters. But I put it in ANSI because I do another step after this, because, if you’ve ever copied a post and its comments and pasted the text, you’ll know that there is a lot of extra information that you don’t need, cluttering up your screen. Click here to see a text file which comes from copying, pasting into Notepad and saving. And here’s the output from the script. Much neater! Download the Perl script and get more information about it here. Many people around the world feel unworthy or not good enough and this is causing much unnecessary suffering. That’s why I’m sharing this with you today. The content in this post was inspired by Bashar, who is the greatest teacher. You can also listen to this material, with some additional commentary by Bevan Bird, by clicking here. Step 1: Give your negative mind a name. Mine is Nimrod. This will help you become aware that you are not your mind and help you to not get caught up in unhelpful thoughts. Step 2: When you notice your mind giving you advice, thank it and ask yourself whether the advice is helpful or unhelpful. Reason lovingly and logically with your negative mind and win. Step 3: Bring your attention to a mental anchor in the present moment. You can use any of your senses. Go with whichever sense feels strongest or easiest to hold your attention on. Cheryl Keaton suggested to me to “pause whatever you are doing, many times throughout the day and feel your palms, or the centres of the bottoms of your feet.” You may feel energy flowing out of your feet into the Earth. This helps you ground and be present. Feel your palms and breathe naturally. Count your breath cycles (in and out count as one cycle.) That gives the monkey mind something to do, so you can be free of its tyranny. Step 4: Repeat this process (Steps 2-3) every time your mind gets distracted by an unhelpful thought. We are happiest and most successful and at peace when we focus on what we are doing or being, not on thoughts from the past or worries about the future or what other people think about us! Note: Daily meditation will also help you be more mindful. The Steps 1-4 come from A Six-Minute Guide To Taming Your Mind contained in Chapter 3 of Freedom by Design: Living Life on Your Terms by Estela Kun, John Abbott et al. The author of Chapter 3 is Andrea Featherstone, and this chapter is about freedom from your nutcase mind. She offers mind-taming for indecisive overachievers. 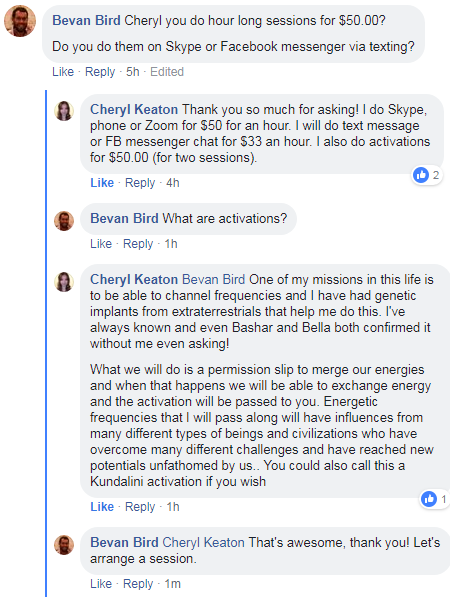 Cheryl Keaton is my Enlightened Partner and this is her website. 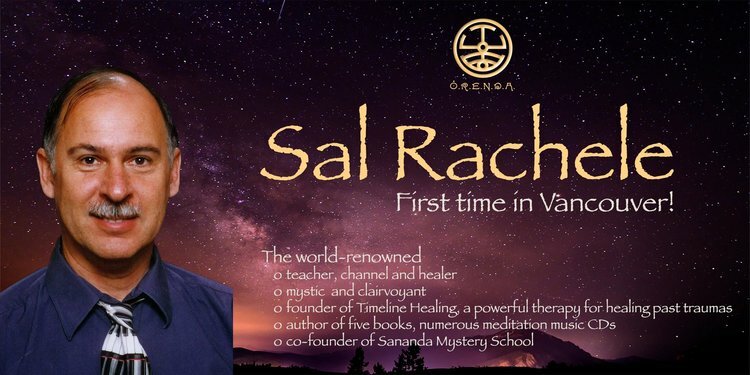 She offers channeling and remote Kundalini activation sessions. You can also connect with her on Facebook. Ground yourself every morning and multiple times throughout the day. This is an anchor that enables you to raise yourself up and explore higher vibrations while staying oriented. Click here for the Grounding meditation in writing. Or in Audio. I easily accept new worthiness thoughts. I am prepared to increase my self worth now. I accept that I am good enough. I am more than good enough. I am enough, I do enough, I have enough. I am way more than enough. I am amazing! I was created perfectly, for a reason. Creation doesn’t make mistakes. I am worthy because I exist. PERIOD. There is no “out there” out there. The universe is inside me. I create reality with my beliefs. I do what I BELIEVE will bring me pleasure. I avoid doing what I BELIEVE will bring me pain. Are your actions in alignment with your excitement and your preferences? What are you absolutely terrified might happen if you allow yourself to be who you really are? This indicates your negative belief. Ask if you believe if that belief serves you, and of it doesn’t, you will let it go! “The past” does not affect your present. The present is all that truly exists. The past and future exist as parallel realities, to this one. In the present is all your power, and from here you create your new past and future, both of which are always changing. Know that you are one with all of creation. There is a benevolent power that loves, supports and guides you constantly. The greatest service you can give is to be your true self. Act on the thing that contains the most excitement and that you have the highest degree of ability to take action on, to the best of your ability until you can take it no further… with no insistence or expectation about what the outcome ought to be. No matter what happens, know that it is manifesting for a reason, to serve you. Choose a positive meaning and gain a positive effect from it. If you feel you are spreading yourself too thin, simplify. Make sure your needs are met. (You have Seven Neutral Needs, listed below.) After that, whatever is your highest excitement, do that. Enough is enough. You don’t need to keep striving for more. That will not bring the inner peace and happiness you desire. Only going within can bring you that, as there is nothing outside you that can fulfill you. There is no “out there” out there! 5) Shelter – or beneficial environment – cave etc. This tip was given to me by Isabell, the hybrid child, channeled by Gita Rose on June 19, 2018. I wrote this script for myself, and being a Canadian, I’m converting each foreign currency into Canadian dollars. Given a csv file which has on each line the foreign currency and the date in the format shown in Example Input Data, the Perl script looks up the exchange rate information and generates a csv file as output. It took 10 seconds to get the data from 100 pages. If you want exchange rate data like this, you can use this script too, or modify it for your own purposes. If you’d like me to modify this, or create a custom script for you, let me know. I am available for hire as a freelancer on UpWork. My profile is here. Dan Teck encourages us to look and see the goodness in the people around us! Who is Dan? He helps you create Your Soulful Book and co-authored Goodness Abounds and other inspirational titles. We will find out why Dan and Jodi Chapman create soulful books, and Goodness Abounds in particular. And much more goodness! This interview was recorded on Nov. 14, the day Goodness Abounds became a #1 Bestseller on Amazon! 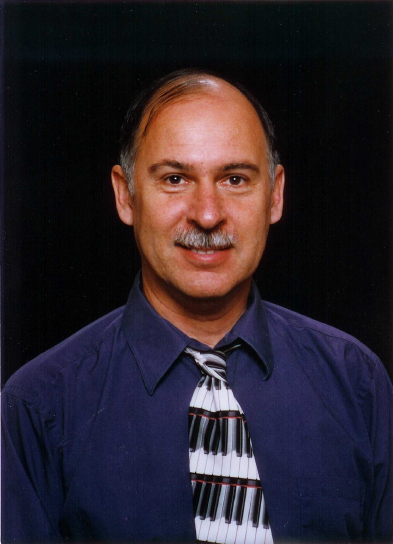 Dan Teck is an author, coach, and Law of Attraction practitioner. 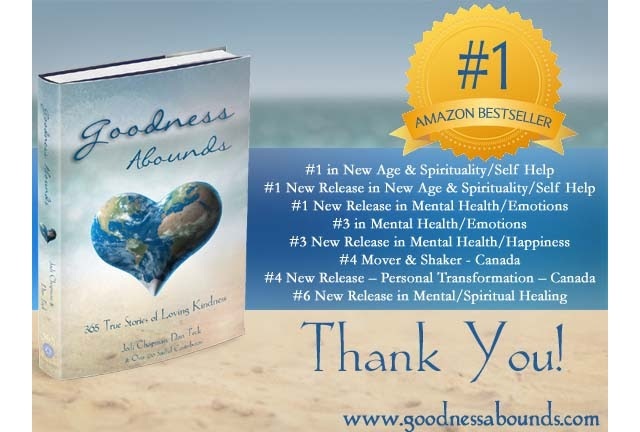 He and his wife, Jodi Chapman, are the co-creators of the bestselling Soulful Journals Series and the 365 Book Series (including the most recent title in this series, Goodness Abounds), as well as Your Soulful Book, a heart-centered writing program. 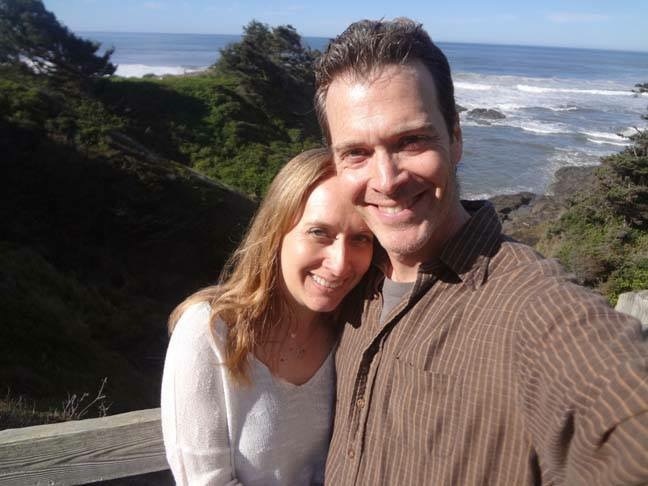 Since 2005, Jodi and Dan have been living their dream of creating books, online communities, courses, and other products that inspire others to connect with their soul and live fully and passionately. Dan has a BA in Religious Studies from Vassar College and an MFA in Creative Writing from Mills College. He and Jodi live on the Oregon coast, where they enjoy hanging out at the beach; spending time with their cats; and working, creating, and playing together. Please let us know what you think, and please share with your friends to brighten someone’s day! So what I’ve done is put together some resources to help you along your path. Get into alignment fast – with the power of your choice! If you liked these resources and want more, go to PositionOnPurpose.com to Get Your Free Spreadsheets to Track the Progress of Building Your Business – Action and Results. #1 tracks the building of the foundation of your online teaching business. #2 tracks your daily and weekly action in building your online teaching business. #3 tracks your daily results: new subscribers, sales, revenue, expenses, and profits. Go to PositionOnPurpose.com to Get Your Free Spreadsheets to Track the Progress of Building Your Business – Action and Results.